Naviator version 3.6.3 has been released to the Play Store. Edit: A newer version is now available here. I had to logon to AOPA from within Naviator to access a flight plan I created in AOPA Flight Planner. How do I log out from within Naviator...or do I log out elsewhere? Oh, I should point out that waypoints I created in AOPA Flight Planner, not previously known to Naviator, were also brought forward with the flight plan and are displayed by Naviator. Am I really logging on to AOPA from Naviator, or, is Naviator only getting my credentials so that it can access my flight plans in AOPA's Flight Planner, i.e., no logout is required? 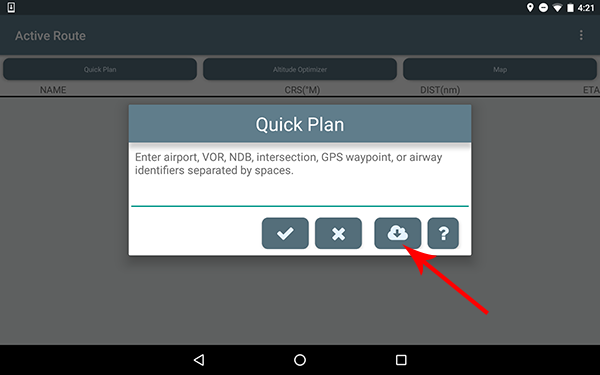 When you enter your AOPA user name and password, it creates a session which automatically expires when you close the Naviator app. There is no need to explicitly log out. Can't wait to try the DIRECT changes in real time in flight. Looks good. nice to see aopa flight plans. also glad to have mute option on targets. altitude report for 1090ES traffic from StratuX showed in Naviator's detail/mute box box as 34,105 feet - but Stratux web page said actual report from aircraft was 34000. Are altimeter shifting corrections in Naviator being applied to the input data when they shouldn't be? How does one unmute a previously muted traffic target? Traffic targets will remain muted until the app is restarted. This function is primarily intended as a way to get rid of persistent ownship "ghost" targets. This is happening because of the way traffic target altitudes are being reported to Naviator. Some ADS-B vendors send target altitudes referenced to GPS altitude, while others are sending the target's pressure altitude referenced to 29.92". Naviator's ADS-B integration was originally written at a time when pressure sensors were not as common in phones/tablets and certainly not within the ADS-B receivers themselves, and these sensors are required in order to calculate accurate relative altitudes based on pressure altitude. In light of this, one of the early ADS-B receivers we supported decided to standardize on sending GPS altitude for the traffic targets, and so this is what we coded. Comparing a GPS altitude (target) to a GPS altitude (ownship) = no problems! Stratux, on the other hand, is apparently reporting pressure altitudes for the traffic targets. Naviator doesn't know this because there is no indication for what altitude reference is being used. Long story short - Naviator is interpreting the target's altitude as a GPS altitude referenced to WGS84 and is applying a geoid correction in order to convert to an altitude above MSL. This is where the 105ft error is coming from. I'm modifying the code so Naviator will interpret target altitudes as pressure altitudes when using Stratux. That said, please keep in mind that in the ADS-B system some traffic targets use pressure altitude and some use GPS altitude and as a result there will always be the potential for some error in the calculation of relative altitudes. It's impossible for Naviator to know which type of altitude is being used. Would it be possible for Naviator to have a setting or some other method to specify which kind of altitude (pressure vs gps) is being provided? I'm assuming your explanation is related to something else I've noticed. My version of stratux is indeed reporting gps altitude (because that's all it knows - I'm not using the gps/pressure combo chip most people are using - I'm feeding position & altitude data via rs-232 nmea from a garmin unit to the stratux). Your explanation above seems to explain why both the altitude on the garmin & that reported on stratux's web interface agree, yet the altitude in Naviator is about 100 feet different. Perhaps if I could tell Naviator not to apply the correction, then I'd see the same altitude on the garmin as I see in Naviator? Thanks for the explanation & all your work on this great app! I'm assuming your explanation is related to something else I've noticed. The issue described by rollawade is a bit different from yours. In your case, I think there might be a bug in the Stratux code that is causing the altitude difference. I'm investigating this further but I'll post more details here when I have them. Ah, ok; thanks, Mike! If there's anything I can do to help debug, feel free to let me know! Tried out yesterday and it works perfectly. Flight plan was retained and new current position waypoint was created with direct routing to revised routing. Nice. Now I'll have to see what to do about multiple point rerouting that converges back to the existing plan. Version 3.6.1 has been released. Release notes are in the original post above. Version 3.6.2 has been released. This is a minor release containing only a few bug fixes. is there a speed trigger or something for displaying pressure altitudes (in the corner of the main display)? previously pressure altitude displayed (running Stratux 0.5b5/naviator 3.6.2) as soon as power and wifi link/heartbeat/gps were in the green. web view of stratux is reporting pressure altitude. But Naviator displays "---". this is while stationary on the ground. I have not trying it yet while moving/flying. There is a new configuration setting on the ADS-B Settings screen called "Override internal pressure sensor". You'll need to enable this in order for Naviator to use the pressure altitude values from Stratux. Ok, found and made altitude override selection to utilize ADB-B pressure altitude. No joy. Webui/gps/ahrs STRATUX altitude shows proper altitude of 972ft p.a., but Naviator is still displaying -----. p.s. I rebooted stratux and naviator. after I had good ads-b green lights (except for ads-b link in orange since the ground station is not seen from this location) and reconfirmed that the problem was as stated above. it is. I did notice that if I select PFD display and request pressure altitude display the vertical tape reverted to 0, GPS indicator stayed the same green color and did not change to something else (an oversight of screen formating I think) BUT there is now a once a second pulse of the displayed tape to a random altitude (30,622 or something likely taken from 1090ES traffic overhead. So..the altitude tape gets yanked from 0 to 36000+ about once a second (much quicker and repeatable than the press altitude box on the main screen). Bug confirmed. I'll get a new build out ASAP. Thanks for reporting this. Version 3.6.3 has been released to correct this bug. Thanks for your patience and help testing! Thanks for the report. I'll be releasing an update tomorrow which will fix this.